“‘Maybe Christmas,’ he thought, ‘doesn’t come from a store. We’ve all heard pontifications on “the True Meaning of Christmas”, so I won’t wax on. 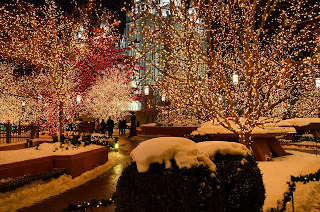 However, I will say that it is fitting that Christmas falls at the very end of the calendar year. 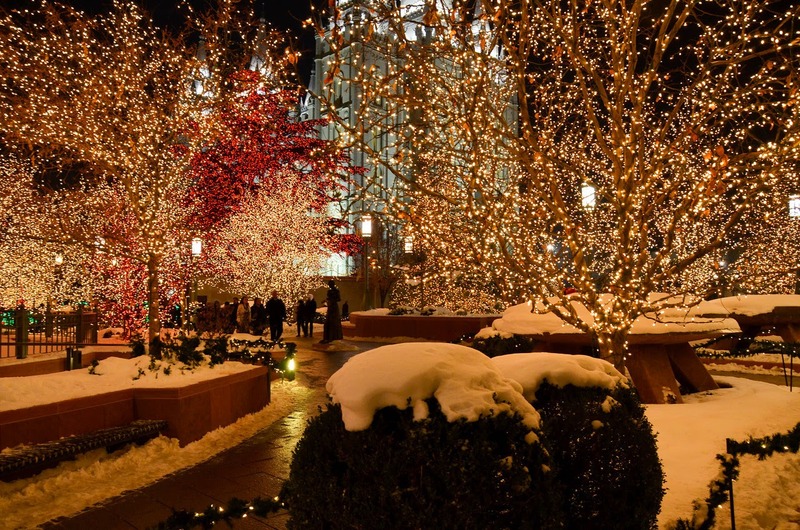 If we choose it to be, we can make it a celebration for the blessings we have received over the course of the year. A chance to reflect on what we have achieved, and prepare our positive attitudes for blessings to come in the next year, beginning a week later. I, myself have been profoundly blessed. Blessed to have a wonderful family, blessed to have another year of sobriety, blessed to be healthy, blessed to be motivated to perform at my absolute best, and blessed to have been given the opportunity to set an example for others, including my family. Early in 2013 I was struck with an insane, uncharacteristic, and seemingly impossible idea. 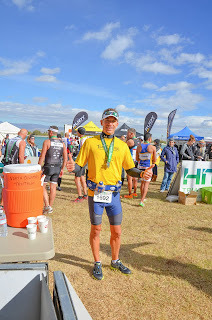 With my arm in a sling, and a gut hanging over my sweat pants, I somehow had the motivation to do an Ironman triathlon. Somewhat of a “New Year’s Resolution”. I had never swam any significant distance, didn’t own a bike, let alone know how to ride a road bike, and the chronic abuse of my lungs and liver made the idea of participating in any endurance sport a laughable proposition. However, the idea struck me with such force that I had no doubt that I would achieve it, and I went about planning for success. A few months ago I wrote an article in for MindBodyGreen called Stop Abandoning Your Goals! In it I advised people to set smaller, more easily achievable goals as milestones to the greater goal. That would make the greater goal more easily achievable. This was part of my “success plan”, to create incremental goals leading to the bigger one. I signed up for Ironman Los Cabos set to take place on March 30, 2014, and then signed up for a number of shorter triathlons leading up to that date. Sure enough, eating a healthy diet and following a strict training plan, I was able to complete two sprint triathlons during the summer, where I was able to gain confidence in open water swimming, and get a feel for the race. Then I finished an Olympic distance triathlon, to get used to racing for multiple hours. Finally, a couple weeks ago, I completed a half Ironman. A far cry from the injured and unhealthy person dreaming at the beginning of the year. So now after completing those distances, while still a significant challenge, the actual Ironman triathlon does not seem as formidable. It is just the next step. And with three months to go before the race, it’s the final stretch of training, so it’s getting real. I know that was a long way from the original message of this post, but it brings us around from reflecting on the past year to how we can look forward to the next. I will no longer look forward to unfulfilled dreams and empty promises. I will continue to dream big and create a road map for achievement. So this year, as you consider your New Year’s resolutions, consider this. Dream big this year. Despite what you tell yourself, you can achieve it. To get there, just take the next step. Set smaller goals to propel you forward. Finally, have a very Merry Christmas, reminiscing on the blessings of the previous year. And may God grace you with a prosperous and dream-fulfilling New Year! 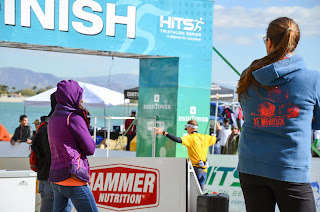 My first impression upon signing up for the HITS Half Ironman Triathlon was that, as a first exposure to real distance, this was going to be about as easy as it could get. The desert is pancake flat (which means no extra energy required to power over hills), the bike course was straight with only a few turns, and in previous years the field had been small. Needless to say, as other challenging factors came into play, my initial impressions became more and more inaccurate. Overall I was not disappointed with this race at all. 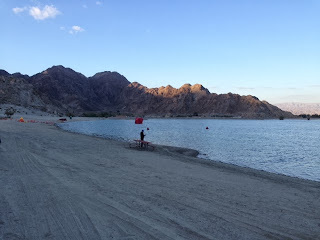 For the price of admission (which is significantly less than other similar distance triathlons), we enjoyed a fantastic race, and a great first experience with this distance which left me wanting to do this distance again… maybe after a bit of rest. To be honest, I wasn’t expecting much. Many of the reports I read from previous years described it as limited in support, with few aid stations, little direction, and sparse porta-potties, but for the most part they received a positive reaction. Besides, I’m relatively low maintenance when it comes to these events, so I didn’t need much in the way of frills. The week leading up to the race I had a couple of priorities. The first was to avoid getting sick at all costs. ‘Tis the season to be fluey, and I did my best to quarantine myself from kids and coworkers had any symptoms of nasty things, and thoroughly bathe myself in sanitizer. Second, I checked the weather report every day, and every day the outlook looked more ominous. Apparently, Canada was attacking the United States with arctic air, and the desert was not safe. 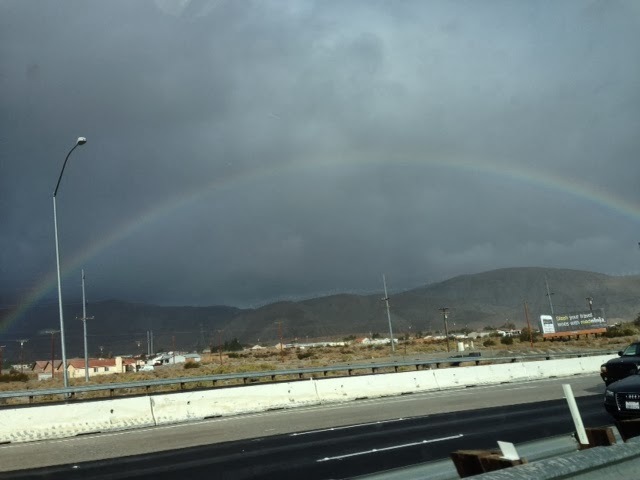 At the beginning of December, Palm Springs could be either 80 degrees during the day or 50 degrees during the day. I had planned for the former but it became apparent that it would be the latter. This was the first indication that it may not be as easy as I expected. We arrived the day before the race to attend the expo and packet pickup, and I caught the pre-race meeting. Apparently, the half was sold out (550 participants), and the full was nearly 200 athletes. This was bigger than previous years from what I had heard. Further more, they would be tightening up the swim course to be very close to shore and two laps (four for the full). This would make the swim very crowded. The second indication that this may be more challenging than I expected. We checked into our room at the Embassy Suites, and were immediately upgraded to a condo, which was great because we now had a kitchen, and didn’t have to go to a restaurant to eat. We would be able to go to the store and have control over our pre-race meal. That’s exactly what we did, and I had my typical eggs, rice, and black beans, plus an apple and almond butter for dessert. Then it was off to bed to stare at the ceiling fan for a few hours before heading off to the race. I arrived at the race venue around 5 am and set up my gear and get a good warm up before the race. 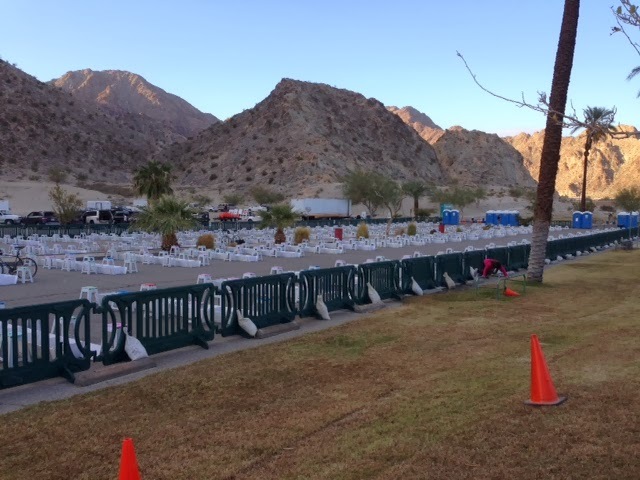 The transition area is truly fantastic, with our own large area and stool. No chance for interference by other people’s equipment, knocking bikes over, etc. It was cold during setup, below 40 degrees, and a lot of spaces remained empty which meant there may be a sizable DNS (did not start) rate. After I set everything up, I got my wetsuit on and ventured down to the water. after taking my socks off, my feet went numb. Walking down, I could feel sharp pebbles on my feet only by the inconsistency in my balance. I was just hoping that I didn’t rip my feet open before the race start. Even though the water was in the 50s, it helped my feet warm up a bit, but submerging my head gave me an imediate ice cream headache which lasted the entire warm up. I had trouble keeping my face submerged for any significant amount of time, and I worried that I wouldn’t be able to swim effectively. 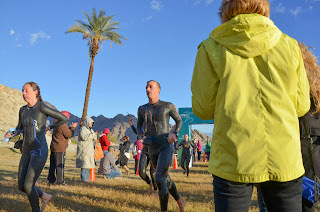 However, after about 10-15 minutes, I became used to the water (only to have to get out for about 10 prior to race start). The swim start was a bit unorganized, as I didn’t hear any signal to start, but people just started swimming. I was caught sort of in the back of the start pack, which was a bit unfortunate because the first leg of the swim was very narrow, and everyone bottlenecked into about a 15-20 yard lane between the shore and the buoy markers (about 5-10 yards of which were 3 feet or less of water). I was not able to make much headway or pass anyone during the first 500 yards of the race, and had to settle for floating down what could only be described as a chaotic “lazy river” of thrashing arms and legs. A good portion of the field was literally walking the first 1/4 of the race, which was entertaining to watch. Finally around the far buoy it opened up a little bit, but it was still quite congested. Due to restrictions with water craft in this lake, they were forced to squeeze 500 athletes through the narrow lanes for two laps (4 laps for the full). I had no open water or ability to pass until the last 3/4 of the swim. Even though my swim was slow, the bright side is I was very fresh for the bike and run (although very cold). Running out of the water, I was able to see my family (parents, wife, sister, & brother in law). While I tried to look heroic, I was trying to run on cold legs, and ended up instead nearly falling over a woman who was picking up her goggles. I proceeded to run up the grass to the transition area once again feeling the sensation of rocks poking through my feet. I had planned on fully changing clothes during the first transition so that I could be warm and dry, thus I knew I would take a bit more time than usual. I figured everyone else would be doing the same, and I wasn’t wrong. I also knew that this would cost me more time, perhaps a few more seconds while I threw on an extra couple layers and gloves. What I failed to anticipate was the effect of the cold on my body at that point. Getting out of the water I was mostly numb, and if anybody has ever tried practicing dexterity in the cold, you know how difficult it can be. I felt like I was trying to guide someone else’s hands, and they weren’t being very cooperative. When I arrived, I saw another person already sitting in transition next to me. My feeling was that as long as I could get out before him I would be okay. Nearly 7 minutes, and three layers of clothing later, and I had achieved my small goal of getting out before him. One thing that I was worried about, especially since my experience in Oceanside, was that I would become too cold on the bike. I have been doing whatever I can to acclimate to heat given my Ironman attempt in March, so I am not very well prepared for cold. The only other thing I was concerned for was the wind. It was expected that at some point during the day (likely the afternoon) the winds would pick up to 20 mph+. Fortunately, my wardrobe plan was successful and I was only numb in my feet. Gradually, however, my feeling came back even there and I don’t recall ever being uncomfortable on the bike. Now it was up to my fitness and my nutrition to take over so that I could win the race against the weather turning bad. For my nutrition I was going to keep it very simple: a blend of sugars and salts mixed into my aero drink to the tune of about 1400 calories. That was calculated for a three hour bike, and was more than the typical 400 calories I usually take in (but I figured I would be exerting more energy over the course of the ride). In retrospect, I think it was a bit too much, but at least it wasn’t too little. I felt great on the bike. Early on there was no significant wind, and the weather was nice. I was so far back on the swim that I didn’t get passed at all on the bike. In fact, I must have passed 100 to 120 people. The course was flat and straight, so it was fairly easy to gauge my output. My heart rate stayed just around the mid 140’s, unless I had passed someone, but never ventured past 150 or so. At only one point did I have to slow down significantly because a big-rig was on the road and was unwilling to pass the other racers. I don’t blame him, of course, as it could be a very dangerous situation. Fortunately this only lasted a couple minutes and I was back to race pace. The only other time I slowed briefly was to pee. This was the first time I have peed on the bike in a race, and I’m abnormally proud that I could pull it off without shame. I will say that it will be much easier when hills play a role, as I had to keep pedaling a bit to keep momentum up. As I approached the last turn back toward transition, it was at that point I could feel the wind starting to pick up. 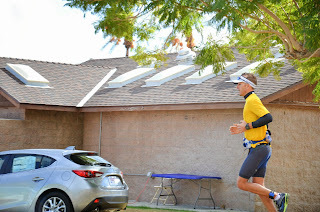 It slowed me down a bit, but I was able to climb into transition successfully and at a personal best for that distance. T2 was relatively uneventful. I got in there and changed my shirt, put on my fuel belt, hat, and shoes and was on my way. I took a quick pit stop at the porta potty (since peeing while running is something I have not yet mastered, nor will I ever), which proved unfortunate for the person coming up behind me. Since there was only one at the exit, he had to wait for me. Immediately when I got on my feet I began to feel the effects of taking in too many calories on the bike. Nutrition is a balance in any race: Take in too little and you risk falling apart. Take in too much and you risk significant gastro-intestinal problems. I was subject to the latter. I could already feel the cramping coming on, and I didn’t feel much like drinking any more. Unfortunately, water would still be required on the run. I heavily considered puking during the first part of the run to open up some room, but decided against it as long as I could hold up sub 8 minute miles. That I did for most of the run. My ultimate goal was to run 7:30 for the full half marathon, and I was successful for the first few miles. At that point I started feeling a bit fatigued and had a couple miles over 8. At the turnaround, I began feeling better and started resuming my earlier pace. I had a quick realization during the run that my bike fitness was much better than my run fitness, as I was immediately passed by a few very fast runners. However, toward the second half of the run I began passing quite a few people (I think I picked up 10-15 spots on the run). Down the road I could see the stoplight where we would make the turn toward the finish and I began to push my pace a bit. I was about to finish 70.3 miles of triathlon for the very first time, and cross one more milestone toward 140.6. My goal was to go sub 5 hours, and I didn’t know where I was at at this point and I didn’t much care. I just wanted to finish, and was happy that I was about to. Arriving at the stoplight I had a horrible realization. The final turn toward the finish was not at a stoplight, it was at a stop sign. I had an extra half mile to go before I made that turn (and then about a mile after that). Already a bit demoralized, I saw a big wall of dust in front of me which seemed to be travelling very quickly to the East. The wind had arrived just in time for my race finish. As I rounded the corner toward the last mile and a half of race I headed directly into the wind, which was gusting at over 20 mph. Looking to my left I realized how good my situation was. Some people were just finishing the bike. Others who were doing the full triathlon, had hours of biking left to go, and then a marathon. Remembering that it’s all about perspective and keeping things positive, I put my head down and pushed on. It was time to finish strong. Just after noon, I crossed the finish line. Official time was 5:04:36. While I didn’t beat 5 hours, I came pretty dang close, and I had a fantastic race. Taking into consideration that it was exceptionally cold and a bit windy, I’m happy with the result. It was good enough for 7th in my age group (out of 43), and 32nd overall (out of 394). Additionally, I beat my personal best half marathon by over 10 minutes, even with the cramping, wind, and cold. Overall I’m ecstatic about finishing this race. Regardless of the time it took to do it (and about 5 hours is pretty good), I was able to successfully complete the distance; 1.2 miles of swimming, 56 miles of biking, and 13.1 miles of running. 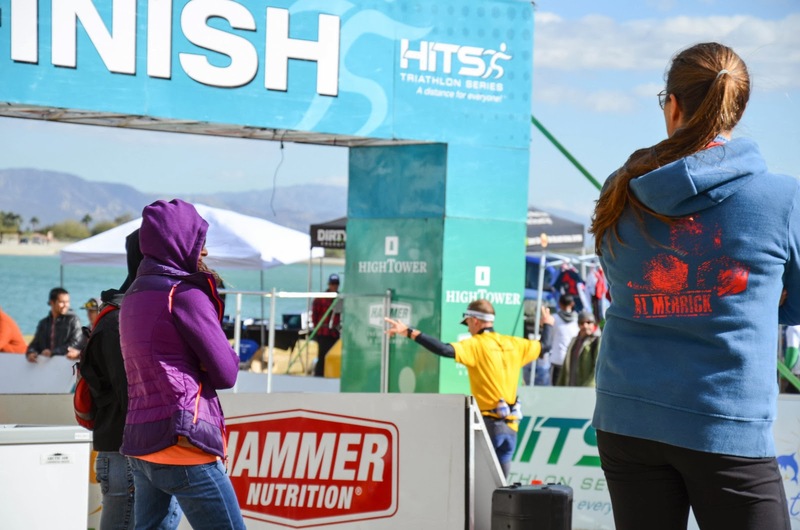 A more miraculous feat came from the 73 athletes who completed the full Iron distance triathlon that day. The DNF rate was likely greater than 50%, as heavy winds hit right at the halfway point. They would also race into the night where temperatures would drop into the 40s. Putting this into perspective, I started at the same time as them (7 am), finished at about noon, hung around for about an hour, drove 140 miles to get home (stopping for lunch), had a long bath, got dressed, drove to Anaheim for a company Christmas party, drove back home, and went to bed. As I lay in bed, having no trouble falling asleep, people were still on the course finishing the full. Right after I finished the race, my Mom asked me if I was ready to do a full. At that moment thinking about doing a full made the contents of my stomach want to take a trip upward and outward. However, it really is about mental preparation. I was thoroughly prepared for a 70.3 this day, and mentally I was conditioned for it. In a little over 3 months time, I will be thoroughly prepared for 140.6, and I will spend the majority of that time mentally conditioning myself for that. Ask me again in three months. I’ll be ready. It’s been a little over a week now and it’s settling in exactly what was accomplished. Less than a year ago I couldn’t bike, could barely swim a few laps, and hadn’t run much in the previous year. A few months of training later and I’ve completed a half Ironman. Next stop, Los Cabos. But first, a couple weeks of rest until Christmas, and then the buildup begins. 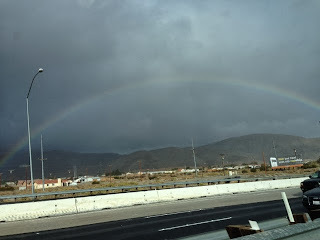 On the drive home we saw a full rainbow… in the desert. It was raining hard and the wind was blowing hard. In about a half hour this weather would reach La Qunita where it would hit athletes doing the full. We’re a little less than a week out from my last race of the season, which I have considered my “A” race – the race I have trained for this season. It is strange to think of this as a primary race, when I still consider it a warm up to the full Ironman in Cabo San Lucas. It is also strange to think of this as the last race of the season when it is only three and a half months until my next “A” race. However, it helps me to think that there is a break between the two so I can catch my breath and get ready for some more intense training volume. 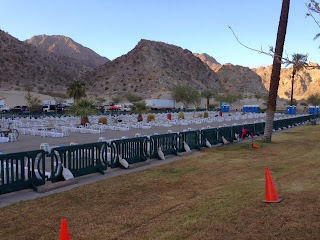 While these things are strange to me, it is also fitting that The HITS Palm Springs Half Iron Triathlon be an “A” race, as it is my first attempt at this distance (half a full Ironman, at 1.2 mile swim, 56 mile bike, and a half marathon). It also happens at the beginning of December, right before Christmas, at which time I fully intend to briefly break away from my strict diet and indulge in the culinary delights of the holidays, including Christmas cookies, chocolate, and figgy pudding (whatever the heck that is, but I’m sure not leaving until I get some!). Moderation is key, of course, and as soon as Santa tucks himself in for his long Winter nap, I’ll be back on course for my plan leading up to Cabo. But back to this race. With less than one week to go, I am in full taper mode, and have been for about a week and a half now. I did a bit of a warm up at about the same distance on Thanksgiving day and felt really good. I can say at this point, barring any sickness or injury between now and then, that I am completely ready for this event. The swim will take place in a reservoir, which will be a new experience for me since I’ve never swam in anyone’s drinking water before. It’s also quite possible that the water can be very cold. Last year it was in the high 50’s. The bike and run will be very flat and at or below sea level, so it should be relatively easy to pace. The only challenges are that the weather and wind can be unpredictable. In the desert it could be very cold or very hot. I’ve planned for very hot, because I can always add layers if it gets cold. When the weather changes, so to does the wind, and it could be pretty brutal. We’ll see how it shakes out. It’s amazing to think that after I finish this race, I am only a few short months away for the main event of this journey that I began almost a year ago. To think of where I came from and where I am now is amazing. I look forward to posting a race report next week, and beginning the next leg of this journey. Until then.